12in. X 12in. X 16 in. 1 1/2 cubic ft., good for books, records, can goods heavy/non-fragile items. 18in. X 18in. X 16 in. 3.1 cubic ft., good for linens, pots and pans, light non-fragile items. 18in. X 18in. X 24in. 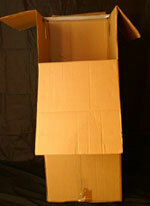 5.2 cubic ft., extra thick cardboard good for fragile items and breakables. 32in. X 36in. X 4in. 40 inches x 60 inches can hold up to three pictures/mirrors. May hold up to thirteen suits or dresses/shoes or linens can go on bottom. $7.00 to rent $12.00 to buy. 25lbs. 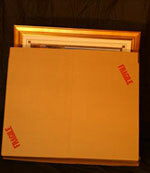 Plain unprinted newspaper for packing fragile items. Tape for sealing boxes and padding furniture. 11in. X 8.5in. X 24in. 13in. X 8.5in. X 24in.